This application is a US National Stage under 35 U.S.C § 371 of International Application No. PCT/SE2003/001078 that was filed on Jun. 23, 2003. The International Application claims priority under 35 U.S.C § 119(a)–(d) to Swedish Application No. 0201976-8 filed Jun. 24, 2002. The present invention relates to compounds and compositions for treating diseases associated with cysteine protease activity. The compounds are reversible inhibitors of cysteine proteases S, K, F, L and B. Of particular interest are diseases associated with Cathepsin S. In addition this invention also discloses processes for the preparation of such inhibitors. Cathepsin S is a member of the papain superfamily of cysteine proteases which also encompasses Cathepsins B, H, L, O and K. Cathepsin S plays a key role in the processing of invariant chain in MHC class II complexes allowing the complex to associate with antigenic peptides. MHC class II complexes are then transported to the surface of the cell for presentation to effector cells such as T cells. The process of antigen presentation is a fundamental step in initiation of the immune response. In this respect inhibitors of cathepsin S could be useful agents in the treatment of inflammation and immune disorders such as, but not limited to, asthma, rheumatoid arthritis, multiple sclerosis and Crohn's disease. Cathepsin S has also been implicated in a variety of other diseases involving extracellular proteolysis such as the development of emphysema in COPD through degradation of elastin and in Alzheimers disease. Other Cathepsins notably K and L have been shown to degrade bone collagen and other bone matrix proteins. Inhibitors of these cysteine proteases would be expected to be useful in the treatment of diseases involving bone resorption such as osteoporosis. and pharmaceutically acceptable salts or solvates thereof, in the manufacture of a medicament for use in the inhibition of cathepsin S in a mammal such as man. In the context of the present specification, unless otherwise indicated, an alkyl or alkenyl group or an alkyl or alkenyl moiety in a substituent group may be linear or branched. Aryl groups include phenyl and naphthyl. Heteroaryl groups include 5- or 6-membered, 5,6- or 6,6-fused heterocyclic rings containing one or more heteroatoms selected from N, S, O. Examples include pyridine, pyrimidine, thiazole, oxazole, pyrazole, imidazole, furan, thiophene, quinoline, isoquinoline, benzimidazole, benzofuran, benzothiophene and indole. 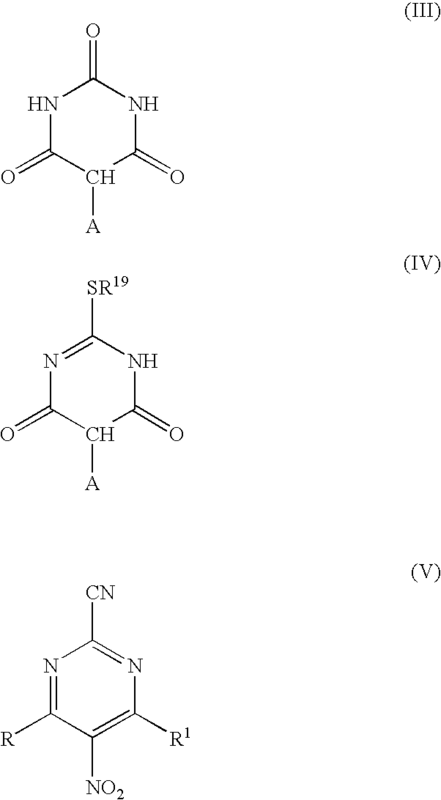 Certain compounds of formula (I) are capable of existing in stereoisomeric forms. It will be understood that the invention encompasses all geometric and optical isomers of the compounds of formula (I) and mixtures thereof including racemates. Tautomers and mixtures thereof also form an aspect of the present invention. Preferably X is CH, NHR2, OR2 where R2 is preferably H or C1-6 alkyl. Preferably R is a group Y(CH2)pR7 where p is 0 or 1 and Y is NR8 where R8 is hydrogen and R7 is substituted phenyl. Preferably R7 is phenyl substituted by halogen, especially chloro. More preferably R7 is phenyl substituted by chloro in the 4-position. Preferably R1 is a group NR13R14 where R13 and R14 together with the nitrogen atom to which they are attached form a morpholine ring, piperidine or piperazine ring optionally substituted, or R1 is a group NR9R10 where R10 is H or C1-6 alkyl and R9 is C1-6 alkyl which can optionally contain one or more O, S or NR4 groups where R4 is hydrogen or C1-6 alkyl. The most preferred substituents for R and R1 are those of the examples exemplified herein. In a further aspect the invention provides a compound of formula (I) as defined above but where X is CH, NHR2, OR2 where R2 is preferably H or C1-6 alkyl. For the novel compounds of the invention other preferred groups and compounds are those defined above. wherein L1, L2 and L3 represent a leaving group (e.g. halide, sulphide, sulfoxide or sulphone group), preferably the sulphide is oxidised to a sulphoxide or sulphone group before displacement. An oxidising agent such as a peracid may be used, for example meta-chloroperbenzoic acid in dichloromethane at room temperature. L1 and L2 may be displaced by R and R1 respectively where R and R1 are defined in formula (I) and L3 may be displaced by a cyanide salt. The sequence of displacement of L1, L2 and L3 may be varied. (ii) when X═CA and A=NH2 reaction of a compound of general formula (V) under a hydrogen atmosphere with palladium catalyst at room temperature. According to a further feature of the invention there is provided a compound of the formula (I), or a pharmaceutically acceptable salt thereof, for use as a therapeutic agent. The invention also provides a compound of the formula (I), or a pharmaceutically acceptable salt thereof, for use as a medicament; and the use of a compound of the formula (I) of the present invention, or a pharmaceutically acceptable salt thereof, in the manufacture of a medicament for use in the inhibition of a cysteine protease in a warm blooded animal, such as man. In particular the compounds of the invention are useful in the treatment of inflammation and immune disorders such as asthma, rheumatoid arthritis, COPD, multiple sclerosis, Crohn's disease, Alzheimers and pain, such as neuropathic pain. Preferably the compounds of the invention are used to treat pain, in particular neuropathic pain. In particular the invention provides the use of a compound of the formula (I) of the present invention, or a pharmaceutically acceptable salt thereof, in the manufacture of a medicament for use in the inhibition of Cathepsin S in a warm blooded animal, such as man. In order to use a compound of the formula (I) or a pharmaceutically acceptable salt thereof for the therapeutic treatment of mammals including humans, in particular in the inhibition of a cysteine protease, it is normally formulated in accordance with standard pharmaceutical practice as a pharmaceutical composition. Therefore in another aspect the present invention provides a pharmaceutical composition which comprises a compound of the formula (I) or a pharmaceutically acceptable salt thereof and a pharmaceutically acceptable diluent or carrier. The pharmaceutical compositions of this invention may be administered in standard manner for the disease condition that it is desired to treat, for example by oral, rectal or parenteral administration. For these purposes the compounds of this invention may be formulated by means known in the art into the form of, for example, tablets, capsules, aqueous or oily solutions or suspensions, (lipid) emulsions, dispersible powders, suppositories, ointments, creams, drops and sterile injectable aqueous or oily solutions or suspensions. A suitable pharmaceutical composition of this invention is one suitable for oral administration in unit dosage form, for example a tablet or capsule which contains between 100 mg and 1 g of the compound of this invention. In another aspect a pharmaceutical composition of the invention is one suitable for intravenous, subcutaneous or intramuscular injection. Each patient may receive, for example, an intravenous, subcutaneous or intramuscular dose of 1 mgkg−1 to 100 mgkg−1 of the compound, preferably in the range of 5 mgkg−1 to 20 mgkg−1 of this invention, the composition being administered 1 to 4 times per day. The intravenous, subcutaneous and intramuscular dose may be given by means of a bolus injection. Alternatively the intravenous dose may be given by continuous infusion over a period of time. Alternatively each patient will receive a daily oral dose which is approximately equivalent to the daily parenteral dose, the composition being administered 1 to 4 times per day. Buffers, pharmaceutically-acceptable cosolvents such as polyethylene glycol, polypropylene glycol, glycerol or ethanol or complexing agents such as hydroxy-propyl β cyclodextrin may be used to aid formulation. The above formulations may be obtained by conventional procedures well known in the pharmaceutical art. The tablets (a)–(c) may be enteric coated by conventional means, for example to provide a coating of cellulose acetate phthalate. 4-Chloroaniline (8.28 g) was added to a mixture of trichlorotriazine (6 g) in acetone/ice-water (1:1, 60 ml) and stirred for 1 h. The solid was filtered off and dried to give a light brown solid, 8.5 g.
A solution of dimethylamine in tetrahydrofuran (2M, 1.1 ml) was added to a mixture of the product from step (i) (0.3 g) in acetone (10 ml) and ice-water (10 ml). After stirring for 1 h, the solid was filtered, washed with water and dried. Yield 0.3 g solid. Morpholine was added dropwise to stirred solution of trichlorotriazine (6.7 g), N,N-diisopropylethylamine (60.5 ml) in dichloromethane (50 ml) at −78° C. The solid formed was filtered off, washed with water, dried to give a white solid (6.7 g). Examples 3–26 were prepared according to the methods of example 1 or 2 using the appropriate amines. MS: APCI(+ve) 345(M+1) 1H NMR: (DMSO-d6) δ 9.29(1H, s), 8.92(2H, s), 7.67(2H, d), 7.40(2H, d), 3.83–3.80(4H, m), 3.69(3H, s), 3.25–3.23(4H, m) Mpt 230° C.
MS: APCI(+ve) 346(M+1) 1H NMR: (DMSO-d6) δ 9.20(1H, s), 7.67(2H, d), 7.38(2H, d), 3.73–3.70(4H, m), 3.68(3H, s), 3.63–3.61(4H, m) Mpt 176° C.
MS: APCI(+ve) 345/7(M+1) 1H NMR: (DMSO-d6) δ 9.12(1H, s), 8.10(3H, s), 7.66(2H, d), 7.38(2H, d), 3.91–3.69(5H, m), 3.65(3H, s), 2.33–2.22(1H, m), 2.08–2.01(1H, m) Mpt 345–7° C.
MS: APCI(+ve) 430/2(M+1) 1H NMR: (DMSO-d6) 90° C. δ 8.94(11, s), 7.64(2H, d), 7.35(2H, d), 3.81(4H, brs), 3.70(3H, s), 3.15–3.09(2H, m), 3.00(4H, brs), 2.86(2H, brs), 2.81(6H, s), 2.03–1.95(2H, m) Mpt 210–2° C.
MS: APCI(−ve) 302/4(M−1) 1H NMR: (DMSO-d6) 90° C. δ 9.08(1H, s), 7.66(2H, d), 7.37(2H, d), 3.62(3H, s), 3.13(6H, s) Mpt 173° C.
MS: APCI(−ve) 357/9(M−1) 1H NMR: (DMSO-d6) δ 9.24(1H, s), 8.10(1H, s), 7.67(2H, d), 7.39(2H, d), 4.17(2H, s), 3.85–3.83(2H, m), 3.66(3H, s), 3.32–3.29(2H, m) Mpt 244° C.
MS: APCI(+ve) 329/331 (M+1) 1H NMR: (DMSO-d6) δ 8.66(1H, s), 7.62(2H, d), 7.39(2H, d), 5.53(2H, s), 3.78–3.76(4H, m), 3.08–3.06(4H, m) Mpt 253–4° C.
MS: APCI(+ve) 289/91(M+1) 1H NMR: (DMSO-d6) δ 8.19(1H, s), 7.50(2H, d), 7.31(2H, d), 6.52(1H, t), 5.20(2H, s), 3.41–3.35(2H, m), 1.18(3H, t) Mpt 211–2° C.
Measurement of Cathepsin S Activity. QFRET Technology (Quenched Fluorescent Resonance Energy Transfer) was used to measure the inhibition by test compounds of Cathepsin S-mediated cleavage of the synthetic peptide Z-Val-Val-Arg-AMC. Compounds were screened at five concentrations in duplicate and the pIC50 values reported. Synthetic substrate, 20 μM [final]Z-Val-Val-Arg-AMC in phosphate buffer were added to a 96 well black Optiplate. The assay plates were pre-read for compound auto fluorescence on SpectraMax Gemini at 355 nM excitation and 460 nM emission. 250 pM [final] rHuman Cathepsin S in phosphate buffer was added and incubated for 2 h at room temperature on the SpectraMax Gemini, taking readings every 20 min at 355 nM excitation and 460 nM emission. Activity Based template (5PTB-8) used the auto fluorescent corrected data to calculate the percentage inhibition for each compound concentration using the relevent plate controls. This data was used to construct inhibition curves and pIC50 estimated by non-linear regression using a 4 parameter logistic model. and a pharmaceutically acceptable diluent or carrier. or a pharmaceutically acceptable salt. 3. The method according to claim 2 in which A is H, NHR2, or OR2 wherein R2 is hydrogen or C1-6alkyl. 4. The method according to claim 2 in which R is a group Y(CH2)pR7 where p is 0 or 1 and Y is NR8 wherein R8 is hydrogen and R7 is substituted phenyl. 5. 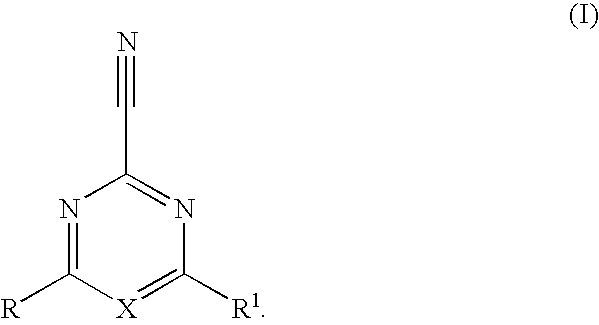 The method according to claim 2 in which R1 is a group NR13R14 where R13 and R14 together with the nitrogen atom to which they are attached form a morpholine ring, piperidine or piperazine ring optionally substituted. 6. The method according to claim 2 in which R1 is a group NR9R10 where R10 is H or C1-6alkyl and R9 is C1-6alkyl which can optionally contain one or more O, S or NR4 groups where R4 is hydrogen or C1-6alkyl. MXPA05007485A (en) * 2003-01-14 2006-01-30 Arena Pharm Inc 1,2,3-trisubstituted aryl and heteroaryl derivatives as modulators of metabolism and the prpphylaxis and treatment of disorders related thereto such as diabetes and hyperglycemia. CH627919A5 (en) * 1977-04-14 1982-02-15 Ciba Geigy Ag Herbicidal agents. HU212435B (en) * 1990-06-07 1996-06-28 Sandoz Ag Herbicidal compositions containing substituted phthalides and heterocyclic phthalides as active ingredient and process for preparation of their active ingredients. ES2314106T3 (en) 2009-03-16 Pyrimidine derivatives, pharmaceutical agents containing said compounds, use and method for generation. ES2279162T3 (en) 2007-08-16 New purin- or pyrrolo (2,3-d) pyrimidin-2-carbonitriles for treating diseases associated with cysteine ​​protease activity diseases. ES2303565T3 (en) 2008-08-16 Aminobenzamide derivatives as inhibitors of glycogen synthase kinase 3beta the.